The carriage rocks and tilts and Ani braces her hands against the hard leather seat, steadying herself above its unpredictability. Once, a long time ago, Mac had told her a story he’d had from his grannie about sending her own daughter – Mac’s aunt – down to Glasgow for work. There were strange hazards to beware of, Grannie Lachlan had said. Don’t talk to young men. Lift your skirt on only one side when you prepare to cross a road; to lift it on both would reveal too much of your ankles. And when entering a tunnel in a train, put a pin in your mouth to stop any bold young man from kissing you. And we laughed and we laughed and we laughed. ‘Might I be so bold?’ Mac had said then, quiet against the train’s roar, although Ani was sure the whole train could have heard him. 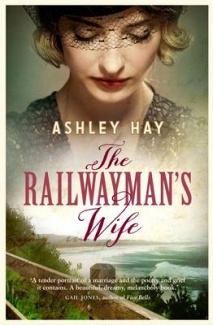 He was a broad man, and sturdy, and the way he pushed against her sometimes it was as if she could feel the whole weight and momentum of his railwayman’s job behind him. Her mouth opens against the memory of it, and as she swallows a sob, the train bursts out of the darkness and onto the coast. The ocean is bright and sharp and the sky above echoes the water’s deep navy in its own thick colour. There is light in the leaves of the trees, blasting them into different greens, shiny and almost metallic, that might properly belong to jewels. There’s so much brightness it’s as if every light in the world has been thrown on; every flare, every candle, every beacon. Above the sound of the train, Ani catches the screech of cockatoos with their improperly loud voices. There are cars on the road below too, people walking on the beach, and wreaths of smoke winding up from the chimneys, tracing illegible messages across the sky. Colour and movement and noise bustle everywhere and it’s life, it’s life. All these stories going on, thinks Ani, while I sit in the dark and open my mouth for a kiss I can’t feel anymore. Definitely sounds like the book will outshine the movie, Lisa. It’s why books can never be surpassed in my universe, the words and phrases that can only be plucked from a page and woven into the imagination. I’ve just finished reading it, Karenlee, and I cannot imagine how they might recreate its translucence in a film. It seems a bit presumptuous to me, and as if people who view it instead of reading it will be defrauded, although they’ll never know it. Thank you so much for continuing to visit my blog – I deserve no such attention such has been my neglect of blogging since September. This is a very vivid passage – the train bursting out of the tunnel into such startlingly bright scene. Love the idea of her putting pins in her mouth to stop young men kissing her. In these days of sexual harrassment accusations this seems a pragmatic and practical approach but also slightly worrying that she would have to think of it. Of course I still visit your blog! Everyone deserves a bit of blogging Time Out every now and again, and I’ll be a subscriber till you retire!